The MAVEN spacecraft was launched toward Mars on Nov. 18, 2013, to discover how the Red Planet lost much of its atmosphere, transforming its climate from one that could have supported life billions of years ago into its present cold and barren state. In light of its continued scientific success, the MAVEN mission was extended from November of this year through September of 2016. This will bring the MAVEN mission cycle in synch with the wider planetary mission review process, planned in 2016, that will determine future mission extensions. Atoms in the Martian upper atmosphere become electrically charged ions after being energized by solar and space radiation. Because they are electrically charged, these ions feel the magnetic and electric forces of the solar wind, a thin stream of electrically conducting gas blown from the surface of the Sun into space at about a million miles per hour. 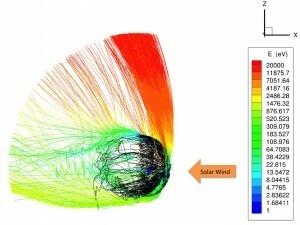 The solar wind and more violent solar activity, such as solar flares and Coronal Mass Ejections, have the ability to strip away ions from Mars’ upper atmosphere through electric and magnetic forces generated by a variety of mechanisms, causing the atmosphere to become thinner over time. MAVEN’s goal is to discover which mechanisms are most prominent for atmospheric loss, and to estimate the rate at which the Martian atmosphere is being eroded away. “MAVEN is observing a polar plume of escaping atmospheric particles,” said Bruce Jakosky of the University of Colorado, Principal Investigator for MAVEN. “The amount of material escaping by this route could make it a major player in the loss of gas to space.” Preliminary MAVEN observations of this phenomenon were presented in March at the Lunar and Planetary Science Conference in Houston, Texas. Theoretical models had predicted that the electric field generated by the incoming solar wind could drive ions in the direction of one pole or the other, creating a polar plume of escaping ions. 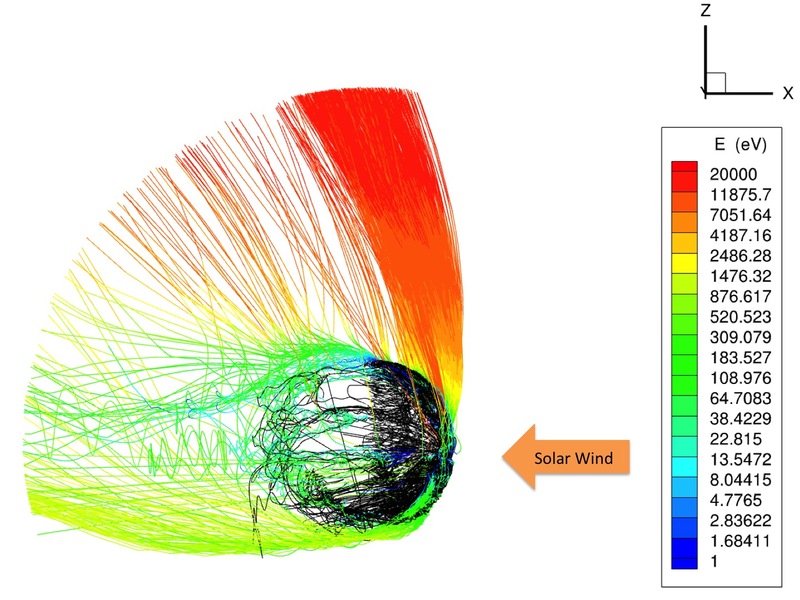 “When tracing particle trajectories in the models, the plume looks a bit like a ‘Mohawk’,” said David Brain of the University of Colorado, an interdisciplinary scientist working on the MAVEN mission. The spacecraft has also seen the Red Planet lighting up under the impact of violent solar activity. Coronal Mass Ejections (CMEs) blast billions of tons of solar material into space at millions of miles per hour. Because Mars is not protected by a global magnetic field like Earth, CME particles directly impact the Martian upper atmosphere, generating diffuse displays of light called aurora. The high-energy particles from the Sun hit the upper atmosphere, excite the atoms that are there, and the atoms give off energy as they “relax” to their ground state. On Earth, the effect of our magnetic field concentrates auroral displays near the Polar Regions, where they are known as the Northern and Southern lights. On Mars, the aurora seen by MAVEN is more diffuse, and the effects also could drive the escape of atmospheric gas into space. MAVEN has previously observed a diffuse aurora on Mars, during an intense solar electron storm that occurred just before Christmas last year, publicized in a press release in mid-March. The mission has now seen two additional occurrences of aurora associated with CME events in March, according to Jakosky. MAVEN’s principal investigator is based at the University of Colorado’s Laboratory for Atmospheric and Space Physics in Boulder. The university provided two science instruments and leads science operations, as well as education and public outreach, for the mission. The University of California at Berkeley’s Space Sciences Laboratory provided four science instruments for the mission. NASA’s Goddard Space Flight Center in Greenbelt, Maryland, manages the MAVEN project and provided two science instruments for the mission. Lockheed Martin built the spacecraft and is responsible for mission operations. NASA’s Jet Propulsion Laboratory, Pasadena, California, provides navigation and Deep Space Network support, as well as the Electra telecommunications relay hardware and operations.